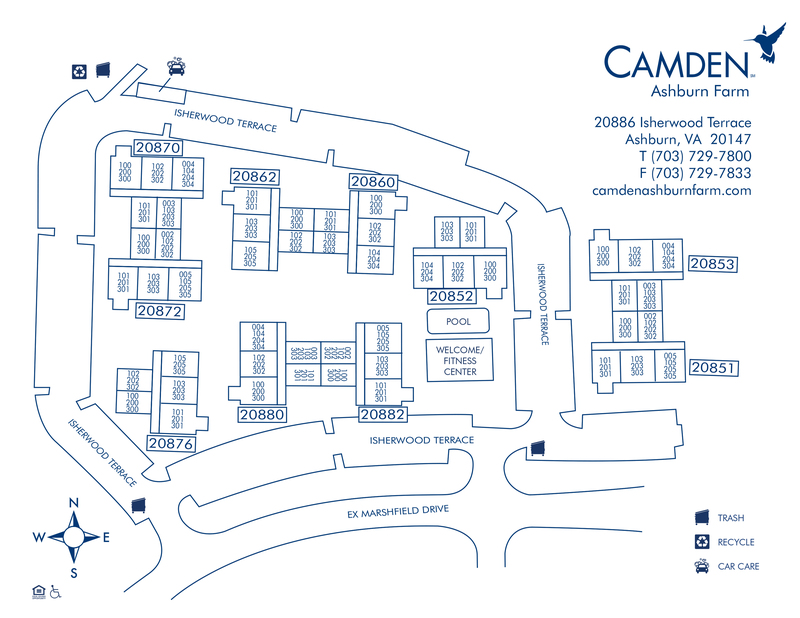 Camden Ashburn Farm features one, two and three bedroom apartment homes in the heart of Ashburn, Virginia of prestigious Loudoun County. Our pet-friendly apartments offer a peaceful retreat from the big city life of Washington D.C. without sacrificing all the convenience that Northern Virginia has to offer. Unwind and enjoy the scenery and unspoiled natural setting surrounded by lush landscaping in one of our beautiful courtyards. You’ll love living only 5 miles from the shops, restaurants, bars and boutiques at One Loudoun. Our prime location also offers easy access to Dulles Greenway and Loudoun County Parkway and is walking distance to the Metro Bus Station. Take a look at our available apartments now! Our smoke-free apartment homes accommodate any lifestyle! Entertain friends and family in your newly upgraded apartment featuring stainless steel appliances, custom espresso cabinetry, wood plank flooring, subway tile backsplash, LED lighting and quartz countertops. You'll love the spacious layouts that include a private patio and you’ll love additional features such as over-sized garden tubs and your gas fireplace. Plus, each apartment home has full-size washers and dryers and may even include a dedicated storage unit. Camden is all about living green, so take advantage of at-your-door trash and recycling pick up. Get social with Camden Ashburn Farm's outdoor dining areas with grills, resort-style swimming pool and resident social events. Work on your fitness at our fully-equipped 24-hour fitness center including cardio equipment and free weights. We take care of our residents with a car care center and 24-hour emergency maintenance. Residents receive a technology package included with a savings of up to 44% off retail. This money-saving package includes high-speed internet up to 100 Mbps and over 140 digital video channels and over 80 HD channels through Xfinity. Use the Xfinity Go app on your smartphone or tablet to access your digital video anywhere! Apartment life at Camden Ashburn Farm means that you get the home you deserve and are only minutes from the area's best shopping, dining and entertainment. What are you waiting for? Call us today at (866) 932-1784! Restricted breeds:Restricted breeds: American Pit Bull Terrier, American Staffordshire Terrier, Staffordshire Bull Terrier, any mix of the previous breeds, or any other dog or breed deemed aggressive. Get the perfect spot! We have open parking for residents and guests on a first-come, first-served basis.